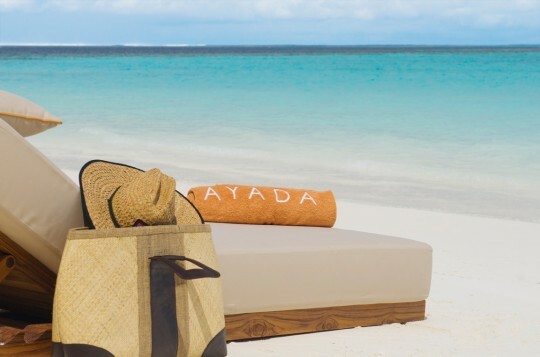 Ayada Maldives, the brand new luxury resort in the Gaafu Dhaalu Atoll in the Maldives is now open and welcomed its first guests on 30th October 2011. Located amidst a pristine reef within the southern rim of the Gaafu Dhaalu Atoll in the southern Maldives, 268 miles south of the capital Male. The island based resort occupies 150,000 square meters of undisturbed and indigenous vegetation and offers uninterrupted views of the breath taking Maldivian landscape. Nestled within the lush vegetation of the island, guests can avail themselves to a variety of dining experiences found in the seven restaurants; each offering a unique culinary experience, an extensive 3500 sqm AySpa & Health Club by leading spa experts ESPA from the UK, a renowned dive and watersports center, kids club and tailor made experiences that will showcase the destination highlights of the Southern Maldives. The resort comprises 33 Beach Villas, 4 Beach Suites, 14 Sunset Beach Suites, 33 Ocean Villas, 11 Sunset Lagoon Suites, 16 Sunset Ocean Suites and the outstanding duplex Ayada Royal Ocean Suite. Designed, planned and constructed keeping in mind the need to provide a unique yet accessible, luxurious yet simple, modern yet authentic experience for guests. All exterior and interior elements have been especially commissioned to use the most durable natural elements and as such there is an abundance of teak, marble and sandstone finishing’s on display. The resort pays special tribute to its Turkish influence by introducing subtle Ottoman style decorative elements in the guest villas and dining venues. Each of the spacious 50 water villas and 62 seafront villas are tastefully designed and furnished to provide privacy and comfort and exclusively offer: a private plunge pool with terrace, direct beach or ocean access and the service of your own dedicated Butler or Guest Relations Agent. Ayada Maldives offers guests seven vividly enticing outlets; each with its unique influence. Ranging from exotic Asian flavours to tantalizing Mediterranean specialties, the unique “Ile de Joie” offering an extensive selection of quality wines and cheese with an array of the finest chocolate and a humidor stocked with a variety of the finest Cuban cigars available to the vibrant “Ottoman Lounge” complete with specialty coffees, teas and shisha, the dining experience at Ayada Maldives is complete with impeccable service and breathtaking views of the ocean and the horizon. “Our vision for Ayada Maldives was to provide a sanctuary for visitors whereby we offer luxurious accommodation and diverse dining options complemented by genuine warmth and hospitality from our employees. It was of paramount importance to us to showcase the beauty and tranquility of the location and thus, the design features large open spaces whereby the natural elements play an integral part of the guest experience with every villa offering plunge pools with large outdoor terrace’s and either direct lagoon or beach access and some villas with glass floor panels. We also wanted to infuse elements of the Ottoman culture in to Ayada Maldives and as such subtle influences can be found in the decorative design of the villas, the Turkish hammam in the spa and the Ottoman Lounge ” Said Mr. Firat Aydeniz, member of the board of directors of the Aydeniz Group. Ayada Maldives’ expansive AySpa has been exclusively designed by leading spa experts to rejuvenate the body, mind and spirit. Centrally located, AySpa is a 3500 sqm haven and forms an enclave within the island vegetation and other resort facilities. Using the natural surroundings as inspiration, the spa showcases sandstone floors with marble and timber hues to reinforce an indigenous feel to complete your spa experience. On offer at AySpa are 8 spacious and tranquil treatment villas some with their own hydrotherapy baths, a segregated steam and sauna area, a cold plunge pool, a warm vitality pool and the Maldives’ first unisex Turkish Hammam including an elaborate marble plinth that can be reserved for private use. 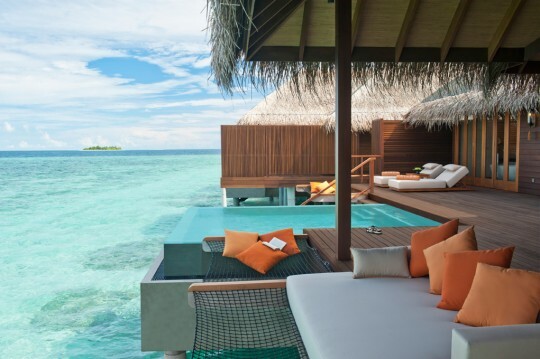 “The location of Ayada Maldives is ideal for the ultimate getaway. The distance from Male enables Ayada Maldives to be an intimate hideaway with our closest inhabited island more than 10 kms away. The proximity to the equatorial line allows for specialized excursions for the lucky few to cross this line. Situated on the outer rim of the atoll allows for Ayada Maldives to be in the vicinity of some of Maldives renowned surf spots and dive sites. The lack of artificial light allows guests to amaze themselves with a beautiful night sky glittering with breathtaking constellations and each villa is positioned to capture views of either the spectacular sunrise or sunsets with infinite views of the ocean” Mr. Aydeniz further noted. Ayada Maldives exclusively features: “Ile De Joie” showcasing a variety of world class cheese, wines, chocolate and cigars from around the world, “The Ottoman Lounge” featuring a variety of specialty coffees, shisha with other Turkish delights, “AySpa” featuring the first Turkish hammam in the Maldives along with 2 Vichy showers with uniquely designed treatments to complement them, “The White Room” offering a unique setting for a wedding or large scale event with a garden setting for up to 450 people, proximity to the best surfing spots available in the Maldives, a large infinity pool with LED lights giving a starry effect in the night, recreational facilities ranging from tennis, mini football, volleyball, badminton and a games room with Xbox, PS3 and pool tables, private plunge pool in each villa, multi-level presidential suite, Kid’s Club and babysitting services, and over water hammocks in certain villa categories. The onsite dive and watersports center offers a range of courses and experiences ranging from Discover Scuba Diving, Open Water Diver, Night Dives, Adventure Dives, Specialty Dive courses, snorkeling, canoeing, wind surfing, catamaran sailing, stand up paddling, and water skiing. An unforgettable and indulgent journey of luxurious pampering awaits all visitors at Ayada Maldives. Savour the infinite views of the spectacular sunsets, delight in the magnificent coral reef, unwind with rejuvenating spa treatments, revel in the long stretches of pristine beach, partake in authentic Maldivian experiences or simply relax with the impeccable and personalized service. Ayada Maldives is owned by Aydeniz Group, which was awarded Europe’s Leading Tourism Development Company 2010 and Asia’s Leading Inward Tourism Development Company 2010 also Maldives’ Leading New Resort and Indian Ocean’s Leading New Resort at the 2011 World Travel Awards . Ayada Maldives has been awarded an International Five Star Diamond Award from The American Academy of Hospitality Sciences in recognition to their commitment to quality and passion to serve. For more information please email [email protected] or visit www.ayadamaldives.com.